This fruit is commonly seen in North Eastern parts of India. Most of you might be unaware of this fruit. 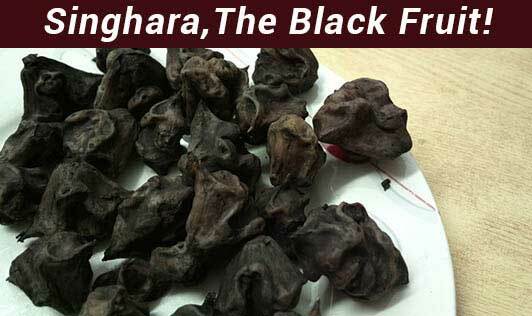 English name of singhara is ‘Water caltrop'. It is a seasonal fruit mostly available in rainy season up to the beginning of winter. Since this fruit is grown in temporary flowing waters, it is supposed to be carrying toxins. The fruit originally green in color is cooked and roasted until the outer skin turns black to eliminate toxins. This fruit is used in the form of flour after drying and is popularly known as ‘singhare ka atta'. It is used in making kheer, halwa, burfis, ladoos, etc and its consumption is encouraged during fasts. • When taken in the form of juice, it reduces nausea and also treats diarrhoea. • In the powdered form, when taken twice a day, it cures cough and treats phlegm. • Since it has detoxifying properties, it clears blood impurities. • As it has high calcium content, it acts as a natural supplement of calcium for breast feeding mothers. This seasonal fruit, though not common in all parts of India, it is available in the form of flour in most of the super markets. This is probably the only fruit out of which you can make rotis and puris!